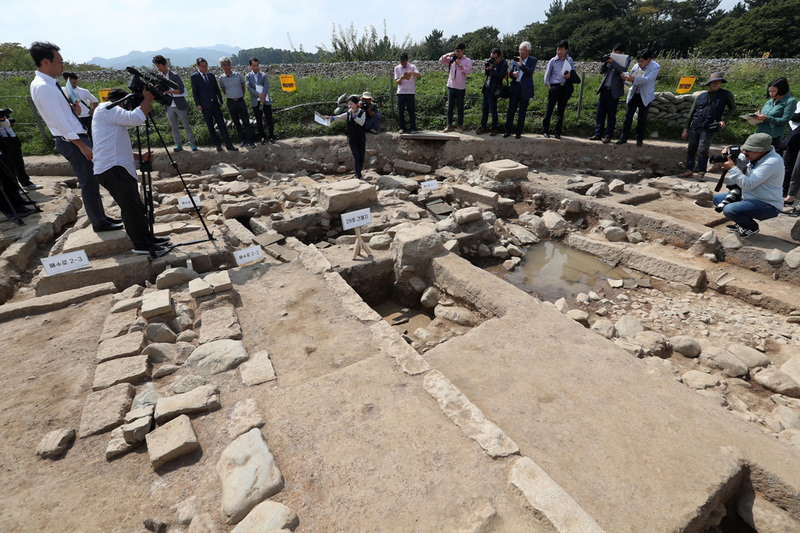 Korean archaeologists have discovered the remains of an 8th century toilet in one of the palaces of the Silla monarchs in Gyeongju, a town of the southeast coast of Korea. The facilities were found by a team from the Gyeongju National Research Institute of Cultural Heritage in the Gyeongju East Palace, a smaller building that was part of the great Dong Palace complex of the ancient kingdom of Silla (57 B.C. – 935 A.D.). It too was a royal residence and therefore only the butts of the royal family squatted over that fine hole in the floor. Made from granite, the toilet features an oval opening in the floor about five inches long with large rectangular stones on both sides of it. The flagstones were tilted upward slightly to ensure that one’s feet would not be getting invited to the evacuation party. The hole in the floor leads to a culvert where the waste was carried away. 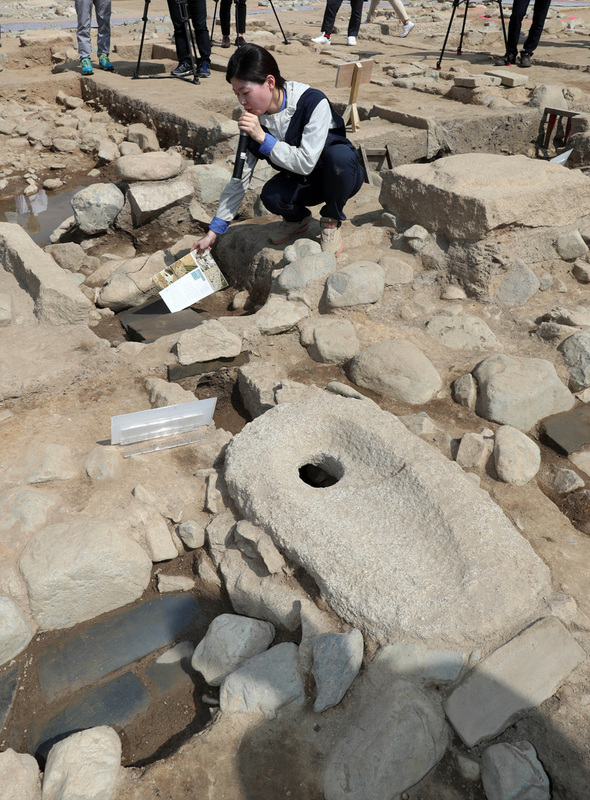 The Gyeongju National Research Institute of Cultural Heritage said Tuesday that excavation work at a site northeast of the Dong Palace in Gyeongju uncovered a stone flush toilet and draining system inside a stone structure. 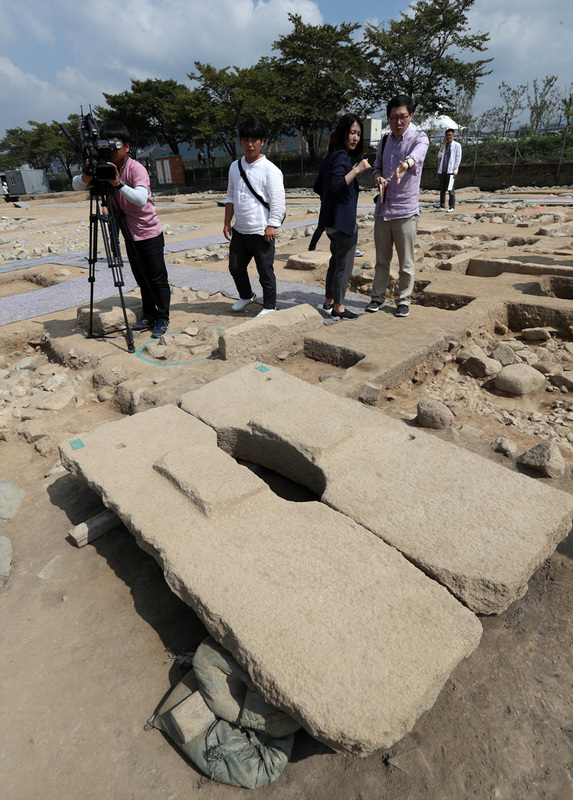 It marked the first time for a bathroom structure, toilet and draining system to all be found at an ancient site in South Korea. The institute explained that the oval-shaped flush toilet, made out of granite, has a drain and two rectangular slab stones on both sides apparently for users to plant their feet on when they are squatting. An institute official said it appears that human excrement was flushed down the drain by pouring water into the toilet given that the bathroom had no water inflow equipment. The rush of water ensured solid waste would move briskly through the culvert which was designed to use gravity as an aid, much like a Roman aqueduct. About 23 feet away from the toilet, the culvert is a foot and a half lower in grade than it is close to it. This incline kept the water (and the many gross things it carried) flowing. The depth of architectural and engineering analysis of waste management systems at the highest levels of social status and rank in 8th century Korea was possible at this site solely so much of the toilet and disposal structure has survived. 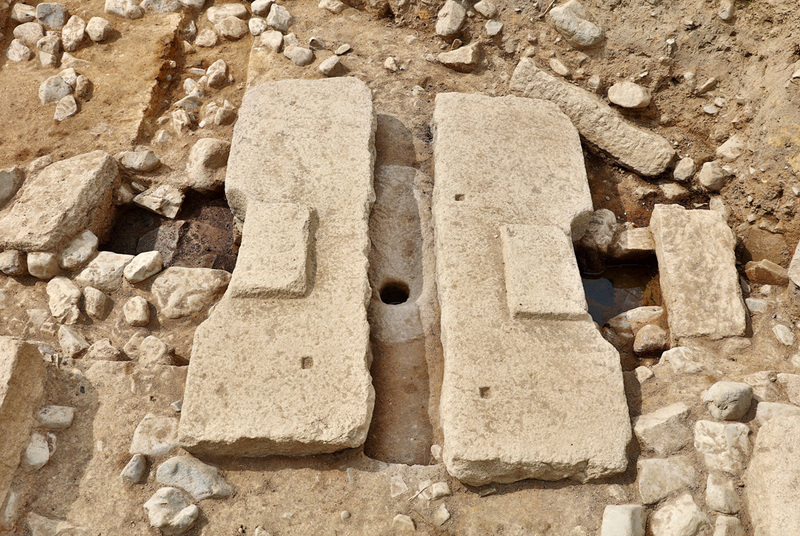 This isn’t the first ancient toilet discovered in South Korea. (One at the Iksan royal palace dates to the 7th century; another at the Bulguksa Temple in Gyeongju from the 8th century.) Those aren’t complete, however. The palace’s draining toilet survives, but it has no foot slabs and no surviving drainage culvert. Same with the monastery. The materials are also very different. Granite was an expensive stone, difficult to quarry and carve. It does not appear in the earlier toilet at Iksan or in the much more modest facilities of the temple. This was one ultra fancy toilet. That’s one of the reasons archaeologists are convinced it was intended for use by members of the Silla royal family. They’re hoping to find some organic remains, microscopic intestinal parasites, perhaps, that will lend new insight into the diet, health of the highest echelon of Silla society. 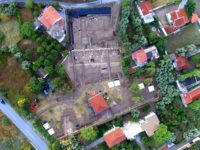 An international team of archaeologists led by the Swiss School of Archaeology in Greece (ESAG) in collaboration with the regional archaeological service have discovered the remains of the long-lost temple of Artemis near the village of Amarynthos on the island of Euboea in Greece. Under the current director the excavations, University of Lausanne Professor Karl Reber, the team has been searching for the sanctuary since 2007, but they’re the new kids on the block, comparatively speaking. Researchers have been looking in vain for more than a century. 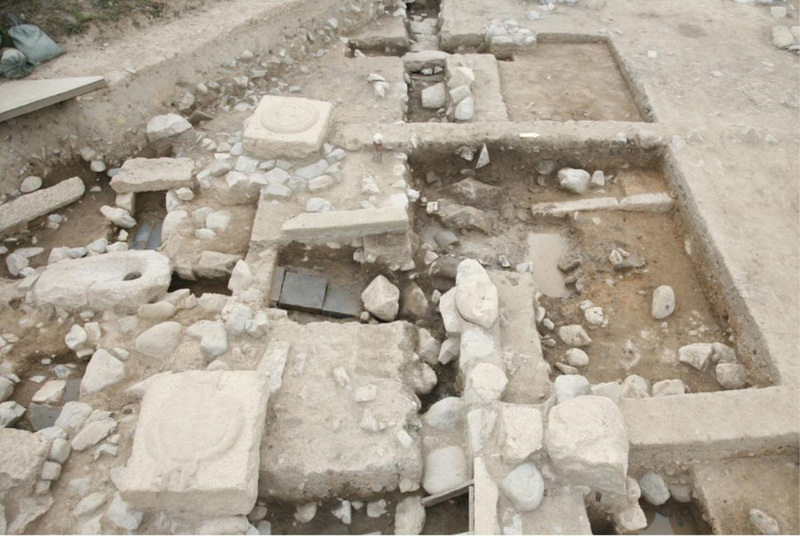 The first Swiss archaeologists were invited to explore the ancient city of Eretria for the temple in 1964. Eleven years later, that initial foray cemented itself into a permanent institution when the mission was recognized by the Greek national government as the Swiss School of Archaeology in Athens. The dig has been so successful it has continued for more than 50 years. In 2014, 50 years after the first Swiss excavation broke ground in Eretria, the ESAG team could claim to have cleared the temple of Apollo, a shrine to Athena, the fortifications of the city’s western gate, a theater, luxury villas with elaborate mosaics, Roman-era public baths and a large gymnasium. The sanctuary of Artemis Amarynthia, however, remained elusive. 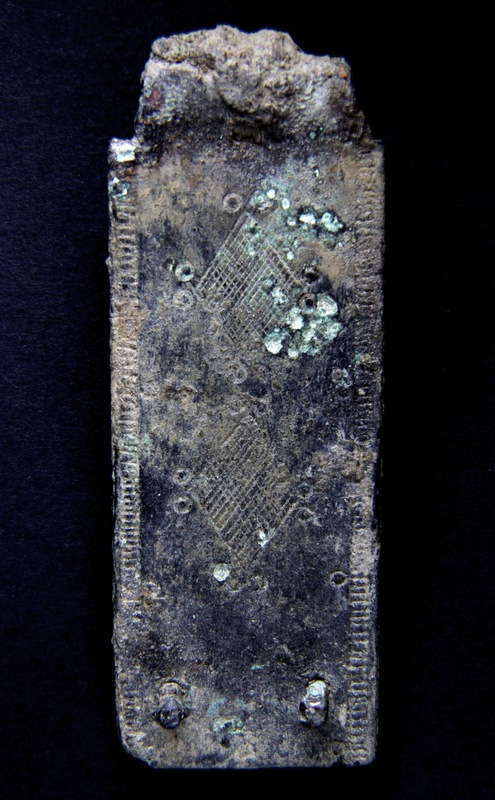 If it had ever been in Eretria, the Swiss team could find no trace of it. Starting in 2007, they moved further afield to study the environs of the city, territories under its control but not part of the actual city itself. At the foot of the Paleoekklisies hill just over five miles east of Eretria, ESAG archaeologists found a monumental portico dating to the 4th century B.C. that ran along the east and north boundary of an open-air structure. This summer, the team dug survey trenches inside the portico perimeter in the hope of finding evidence from the most central location that this was indeed the much sought-after sanctuary. They were successful beyond their wildest dreams. 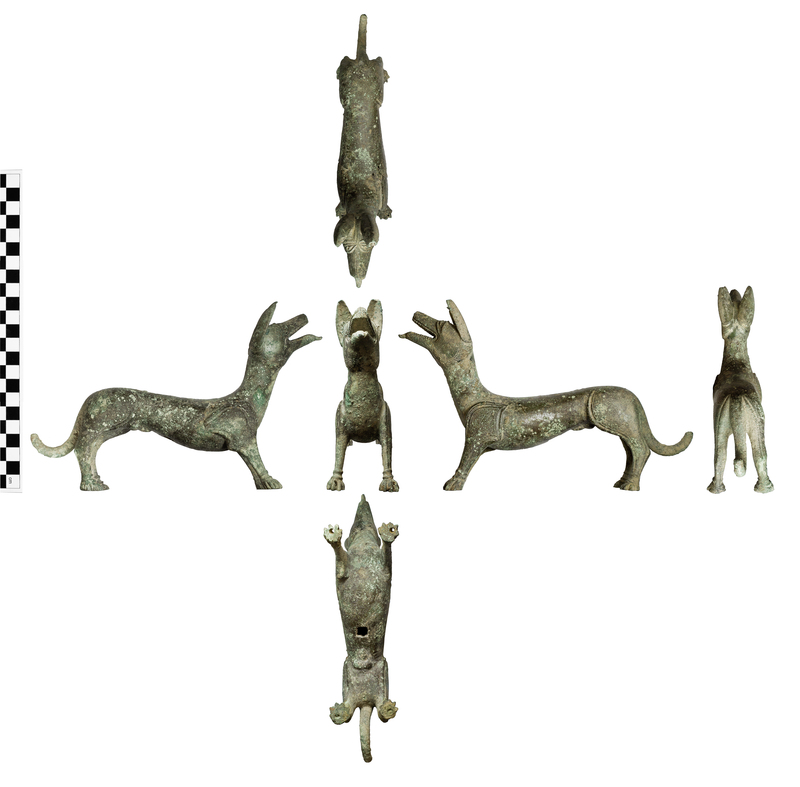 They found the remains of a number of structures constructed between the 6th-2nd century B.C. (the period when the temple was at its most active) and an underground fountain made of architectural blocks and the recycled bases of monumental statues. Those statue bases proved to be the smoking gun that identified the temple. They were inscribed with dedicated to Artemis, her twin brother Apollo and their mother Leto. The inscriptions and the architectural significance of the materials strongly indicate that this was the Artemis sanctuary. 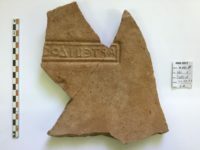 That was confirmed by another discovery, not as glamorous as the statue bases, more on the utilitarian side, but just as meaningful to archaeologists: multiple tiles stamped with the name “Artemidos” (meaning “of the Artemis”) inside a rectangular cartouche. 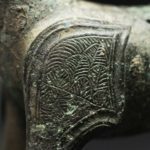 Now, after also finding artefacts with inscriptions, they are sure that they have located the site of the Artemis Amarynthia, which was the end point of the annual procession of people from the once prosperous trading city of Eretrea, 10km away. They held a festival in honour of Artemis, the untameable goddess of hunting in Greek mythology. She was worshipped as the patron goddess of Amarynthos, which takes its name from an Eretrean man who was besotted by Artemis. 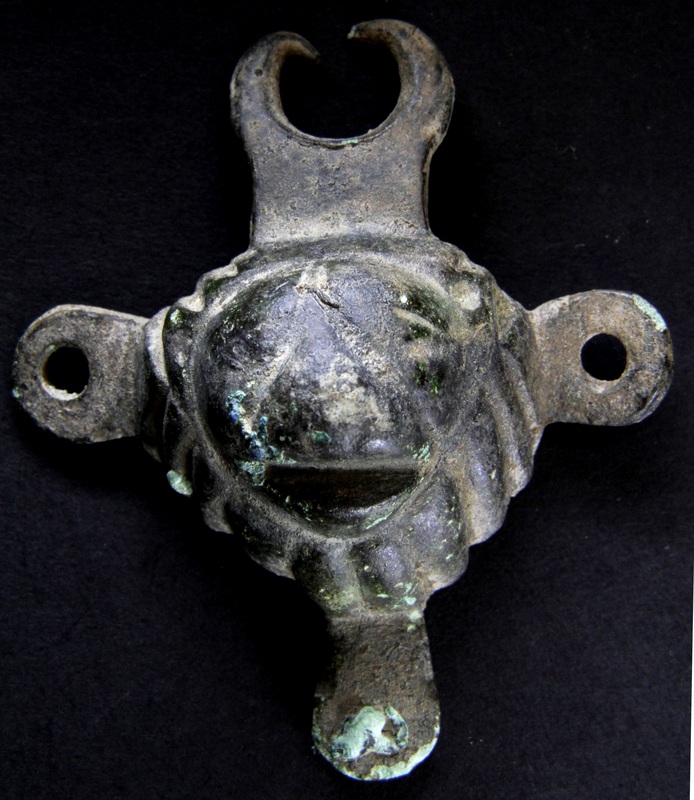 Metal detectorists Pete Cresswell and Andrew Boughton discovered a hoard of Roman bronze in Gloucestershire (the exact location is not being disclosed) that includes a figurine of a type never before found in Britain. 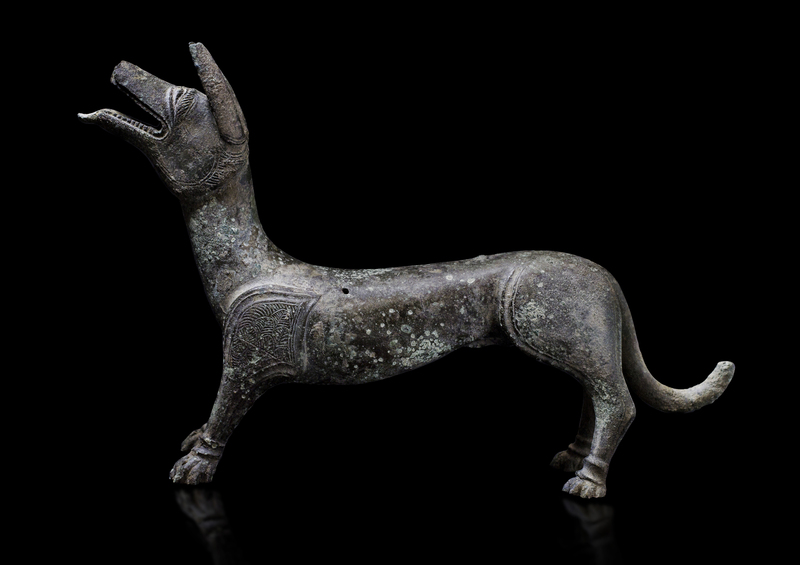 It’s a free-standing bronze statuette of a dog with his tongue hanging out. 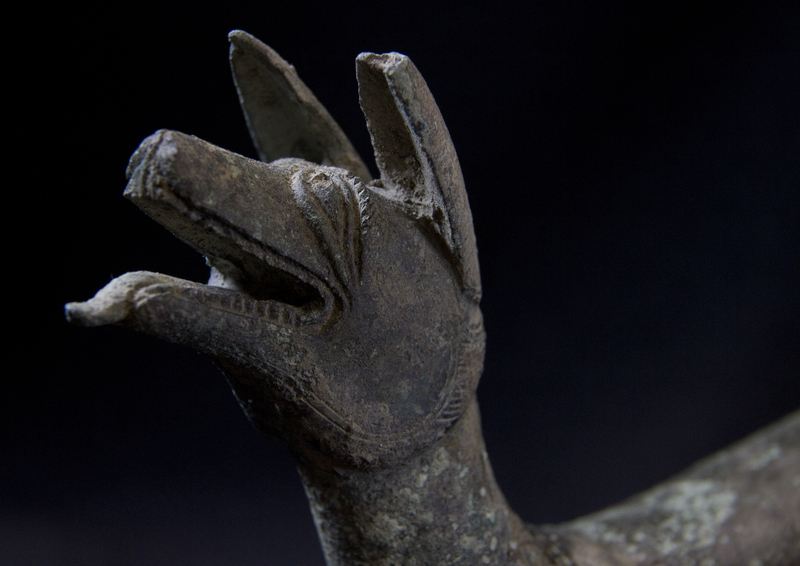 Known as a “licking dog” figure, it is believed to have been a symbol of healing and may have some connection to the temple to Nodens, a deity of hunting, dogs and healing, at nearby Lydney Park. The dog stands at attention, his expression alert and focused upward, like he knows his master has a ball and is waiting for him to throw it. Holes drilled in his paws suggest he was once mounted to a base and there are two more holes on the upper left flank that may have once held pins that were part of the mounting system. There’s also a square hole on its underbelly. Each shoulder is decorated with a sideways teardrop-shaped panel incised with what could be stylized leaf or feather designs. 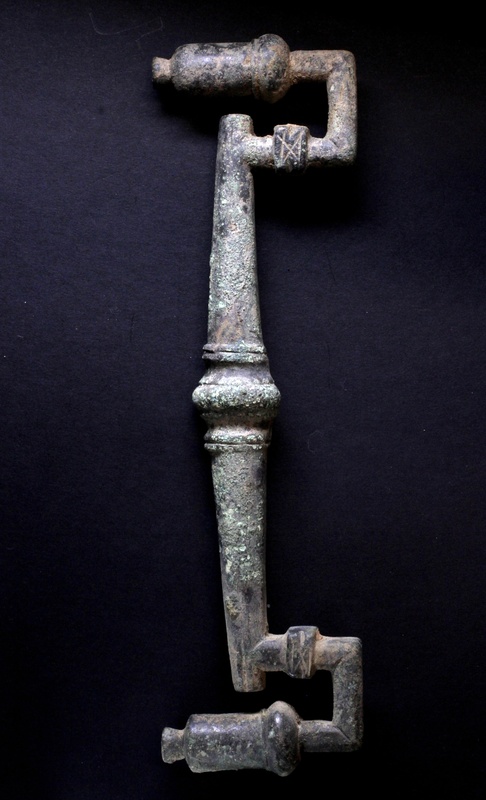 Cresswell, from Gloucestershire, said: “It’s not every day you come across a hoard of Roman bronze. “We have been metal detecting for a combined 40 years, but this is a once in a lifetime discovery. As soon as I realised the items were of historical significance I contacted the local archaeology team, who were equally excited by the find. 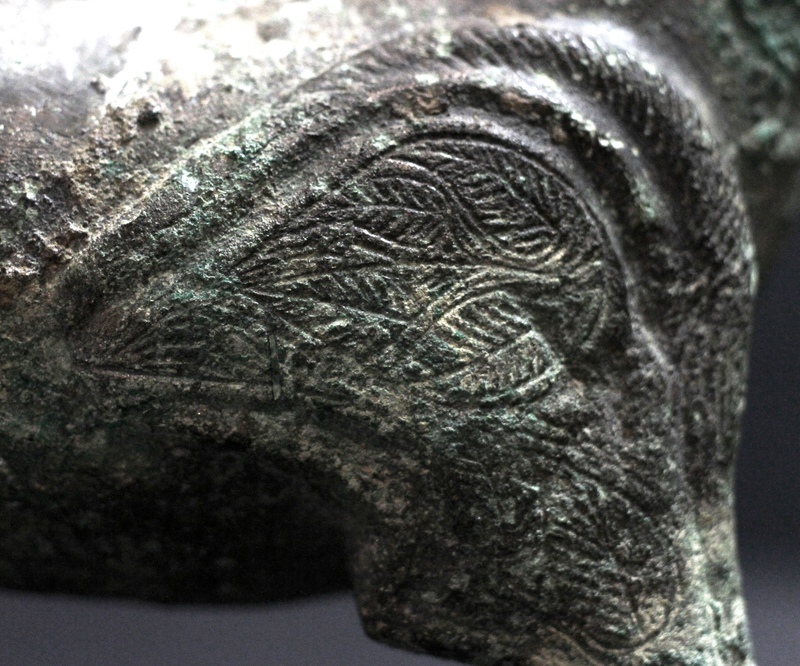 Archaeologist Kurt Adams, Gloucestershire and Avon Finds Liaison Officer, examined the hoard. 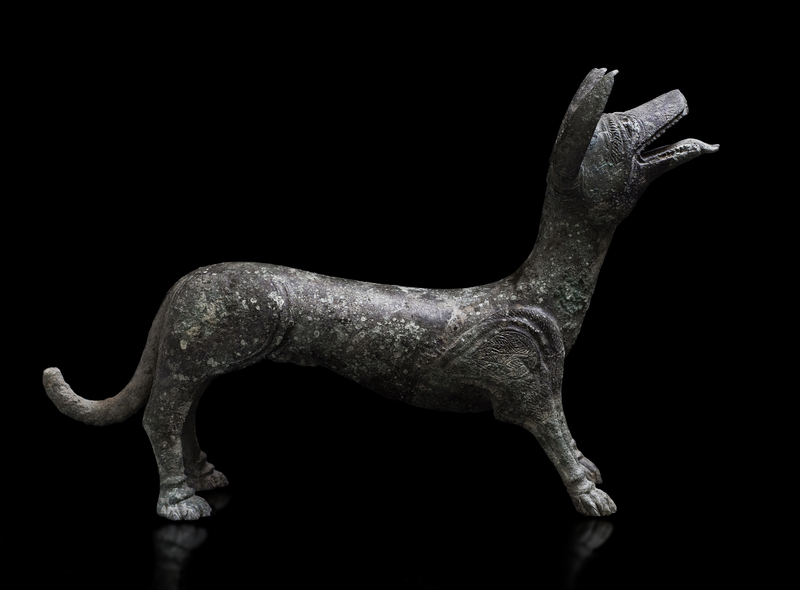 He provisionally dated it to the 4th century (318 – 450 A.D.) and the exceptional dog is the only intact piece in the group excepting a coin or two. The other artifacts are all fragments, mostly made of copper alloy. They include pieces of a broken statue of a person wearing an elaborately draped garment, vase and furniture fittings, escutcheons shaped like animal and human heads, handle terminals, bangles, folded up banding from chests or boxes, a little spoon, a hinge and a great many bits and bobs of undeterminate origin. 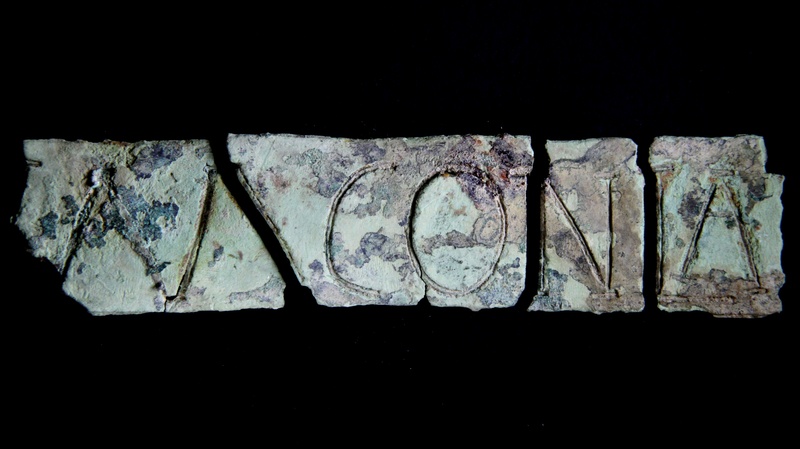 There’s even an inscribed copper alloy plaque broken into four pieces that when puzzled back together reads (V?)MCONIA. 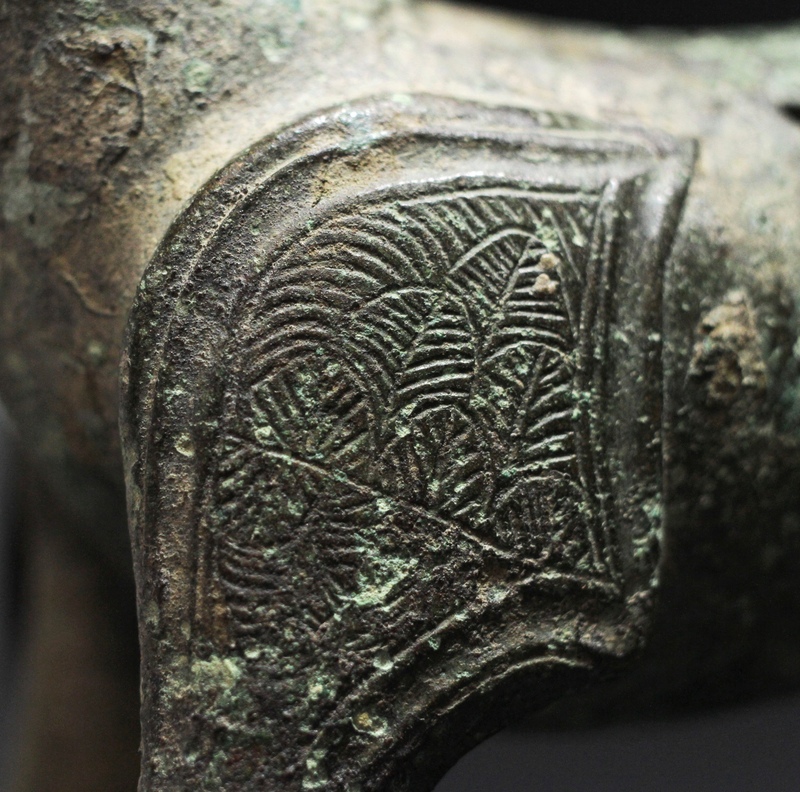 It is curved at the back, suggesting that it too was once mounted on something. 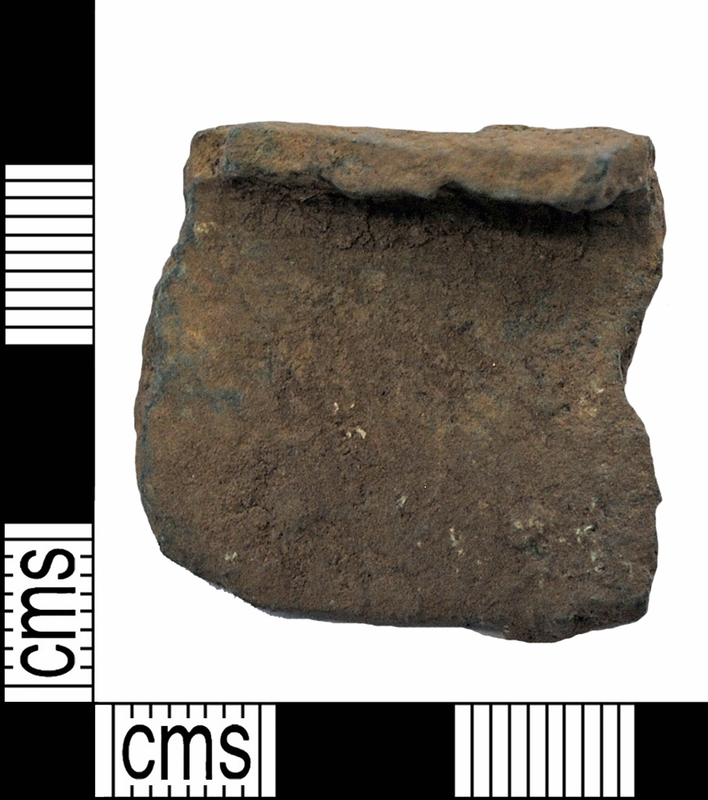 These fragments appear to have been deliberately cut up or broken, perhaps by a metal worker collecting scraps to melt down for reuse. Intact or fragment, these objects are of great archaeological significance and require specialized treatment for their conservation and security. They are being kept at Bristol museum for the time being to give experts the opportunity to fully document, photograph and catalogue them. Once that task is complete, the British Museum’s Treasure Valuation Committee will assess the hoard’s full market value and recommend a reward to be paid in that amount, half going to the finder, half the to the landowner. 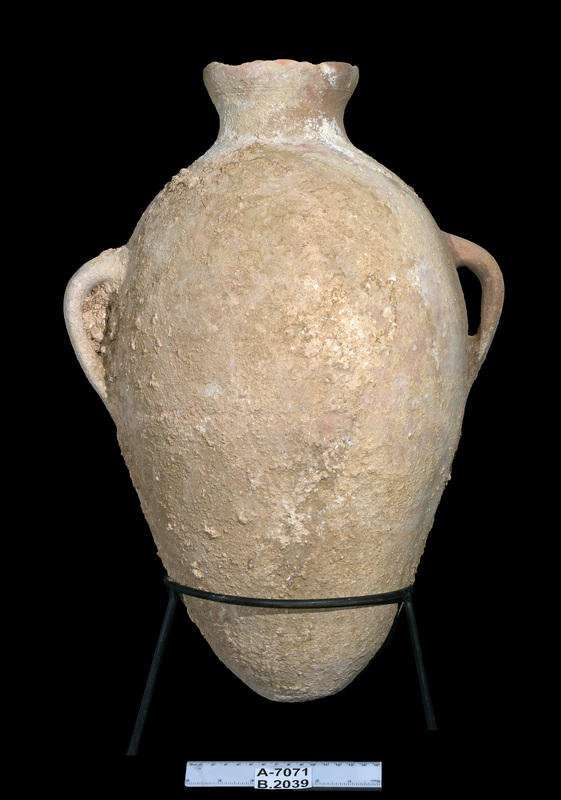 Archaeologists with the Israel Antiquities Authority (IAA) have discovered a jar containing the skeletal remains of at least nine frogs, all of them headless, in a Canaanite tomb outside Jerusalem. The discovery was made three years ago during an archaeological excavation in advance of development in the Minhat neighborhood near the Jerusalem Biblical Zoo. In 2014, the IAA team’s exploration unearthed an intact tomb from the Canaanite period, about 4,000 years ago during the Middle Bronze Age. It contained several clay vessels of different shapes and sizes, some undamaged and in exceptional condition. According to [IAA excavation directors Shua Kisilevitz and Zohar Turgeman-Yaffe]: “For an archaeologist, finding tombs that were intentionally sealed in antiquity is a priceless treasure, because they are a time capsule that allows us to encounter objects almost just as they were originally left. At that time, it was customary to bury the dead with offerings that constituted a kind of “burial kit,” which, it was believed, would serve the deceased in the afterworld. 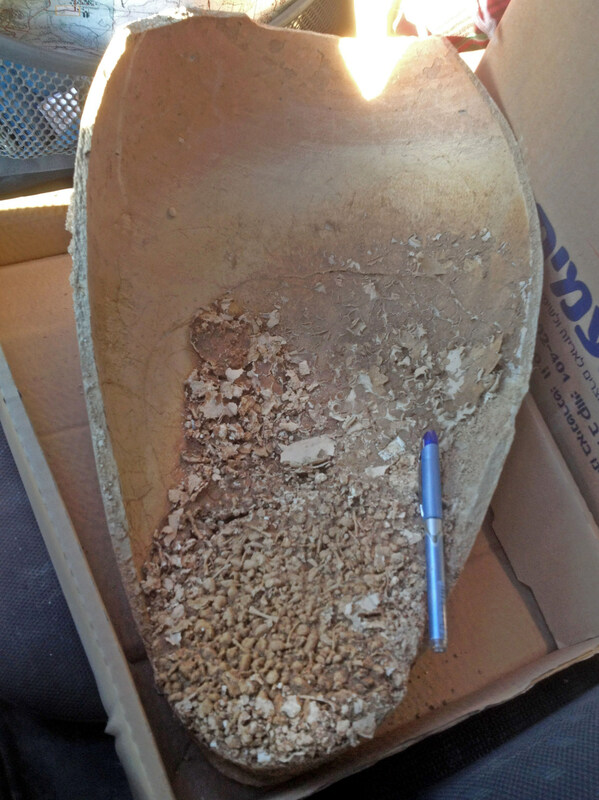 When we removed the stone that blocked the tomb opening, we were excited to discover intact bowls and jars. 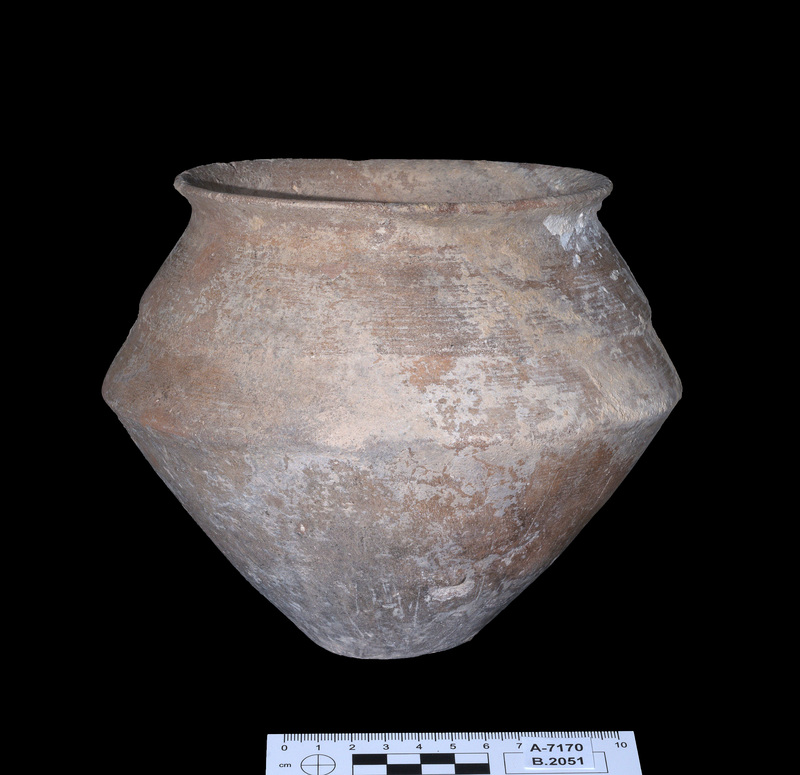 The study also identified material from plants, including date palms and myrtles, in samples taken from inside the clay vessels. These could only have been transferred into the jars shortly before they were buried in the tomb. Date palms and myrtles are not native to the area, so the Canaanites must have planted the trees themselves. According to Dr. [Dafna Langgut of Tel Aviv University], in this period the date palm symbolized fertility and rejuvenation, which could explain why the ancients cultivated the trees in this environment, where they do not grow naturally. According to the scholars, these plants may have been part of an orchard planted in an area where funeral rituals were held, during which offerings of food and objects were made to the deceased. The scholars surmise that the jar with the headless toads was among these offerings. This video from the IAA YouTube channel is in Hebrew with no English subtitles, alas, but it’s well worth watching even if you can’t understand the commentary because there’s cool footage of the intact vessels and the broken one filled with frog bones being recovered from the tomb. You can see how challenging it was to get into the narrow, deep space. 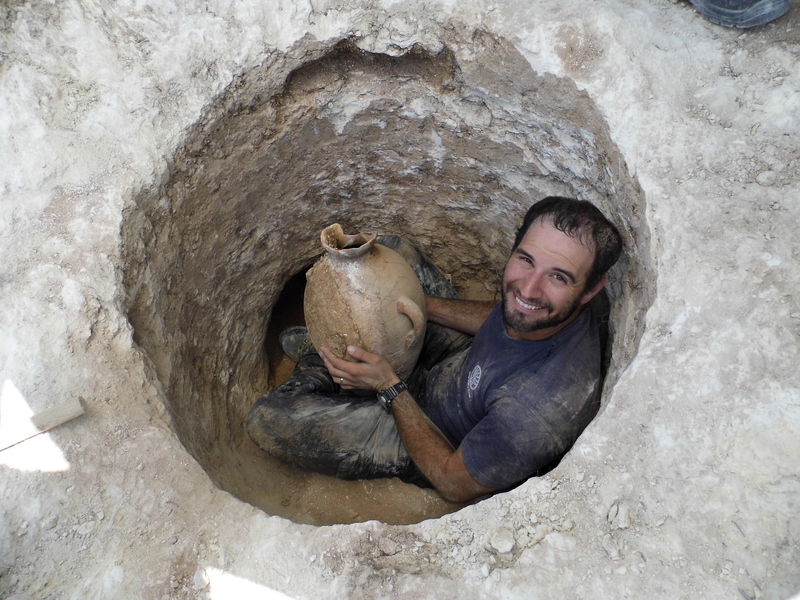 IAA archaeologist David Tanami had to be upside-down and almost completely vertical to reach the opening. The study’s findings will be presented on October 18th at the “New Studies in the Archaeology of Jerusalem and its Region” conference held at the Hebrew University of Jerusalem. The presentation is open to the public. Archaeologists have unearthed the remains of what appears to be a Viking boat grave under the market square in central Trondheim, Norway. In the final days of the excavation, the team of archaeologists from the Norwegian Institute for Cultural Heritage Research (NIKU) recognized a boat-shaped feature in the soil even though there was no visible wood and the site had been repeatedly disturbed by later construction which pockmarked it with postholes and pits. Further excavation revealed that there was no wood left to be found. It has long since rotted away leaving only the imprint of the boat, corroded rusty lumps and the a few barely preserved nails. Those meager features were sufficient for archaeologists to identify them as parts of a boat. It was at least four meters (13 feet) long and was placed in a north-south orientation. Two long bones were also found, which is how we know this was probably a boat burial. They were in very poor condition, however, and only DNA testing can ascertain conclusively whether the bones are human. A piece of sheet bronze found leaning against one of the bones is likely a personal belonging interred with the deceased as a grave good. The very few other artifacts that have been discovered seem to be personal objects as well. Dating is tricky. The team unearthed a small fragment of a spoon and of a key in one of the later postholes dug into what was once the middle of the boat. They can’t be sure these pieces are from the grave, but if they are, then they can loosely date the boat burial from the 7th to the 10th century. 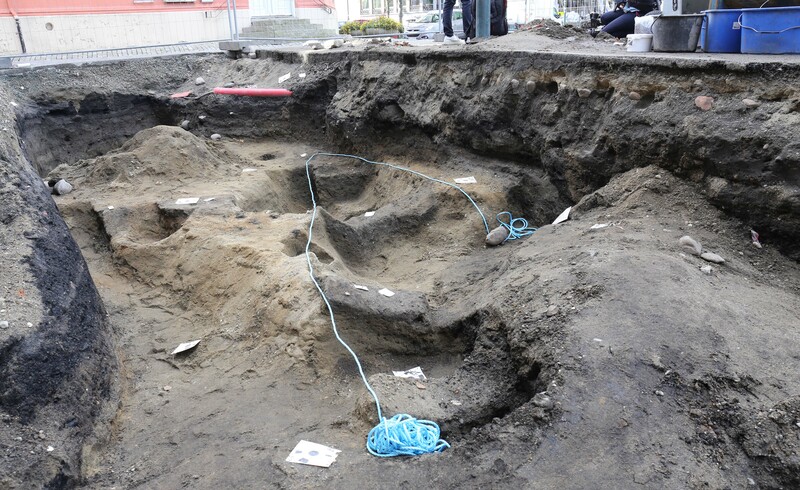 This is the first boat burial from this period discovered in downtown Trondheim. The location away from today’s harbor and the fjord suggests that the boat grave dates from the late Iron Age, or perhaps the early Viking Age. – It is likely a boat that has been dug down into the ground and been used as a coffin for the dead. There has also probably been a burial mound over the boat and grave, says NIKU’s Knut Paasche, a specialist in early boats. He believes that the boat type is similar to an Åfjord boat, which has historically been a common sight along the Trøndelag coast. – This type of boat is relatively flat in the bottom midship. The boat can also be flat-bottomed as it is intended to go into shallow waters on the river Nidelven. Excavations are over for the season and there are no current plans to explore the site further. 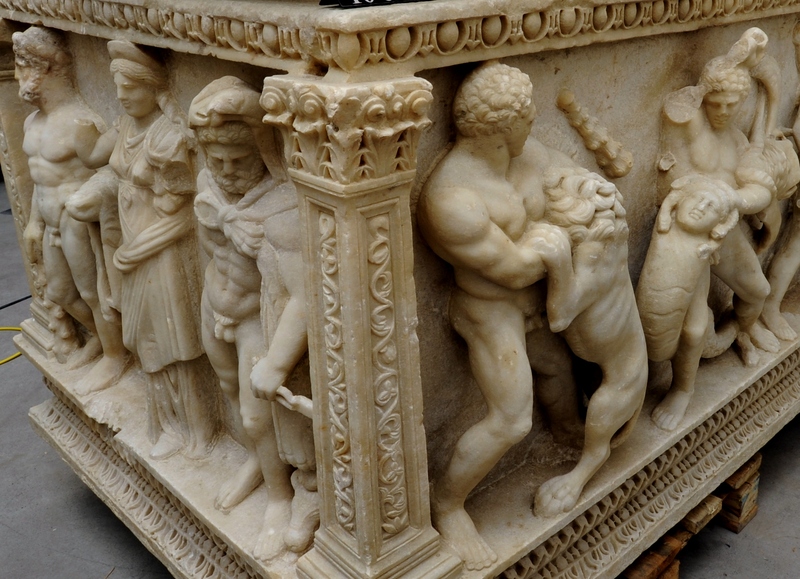 A Roman-era marble sarcophagus decorated with a bas relief of the Twelve Labors of Hercules on its sides has returned to Turkey after a long sojourn in the at haven of looted antiquities smuggling that is the Geneva Free Port. The saga begins on December 3rd, 2010, when the 2nd century A.D. sarcophagus was discovered in one of the Free Port warehouses by customs officials during an inventory check. Measuring 7.7 x 3.7 feet and weighing three tons, the sarcophagus is actually on the smaller side for its type, but it’s still hard to miss as a suspect antiquity, even hidden under piles of blankets and boxes. 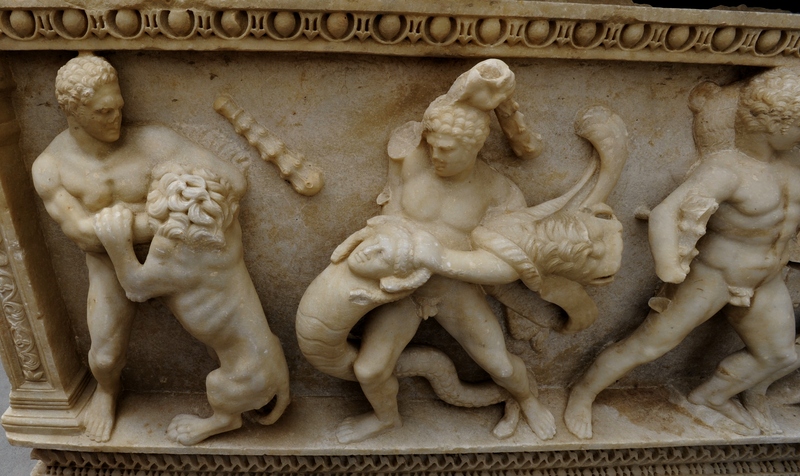 This type of sarcophagus was a popular consumer good, produced on a large scale in workshops in Dokimenion (modern-day Iscehisar, western Turkey) from locally quarried marble in the second half of the second century. They weren’t all cookie-cutter pieces, however. Some are distinctly better than others, commissioned by people who could afford the highest reliefs, the most prized marble and the greatest sculptors. This sarcophagus is the best of all the surviving examples, with top-notch carving depth and anatomical detail. A very wealthy person must have commissioned it. After years of being used as a pivot for the illicit trade in antiquities thanks to its no questions asked approached and tax-free Geneva warehouse complex, Switzerland was now taking a different approach. In 2003, it finally ratified the UNESCO Convention on the Means of Prohibiting and Preventing the Illicit Import, Export and Transfer of Ownership of Cultural Property. In 2005 it passed a law requiring that all objects of cultural patrimony had to have verified ownership records. In 2009, a new law forced international traders in cultural goods to file complete and accurate inventories. This law had teeth too, with funding for a customs notification system and thorough inspection of the goods stashed in Free Port warehouses. So when the sarcophagus’ so-called owner, Phoenix Ancient Art, an antiquities dealership co-owned by brothers Ali and Hicham Aboutaam who have been involved in many, many highly questionable transactions of looted artifacts, was unable to provide proper documentation in compliance with Switzerland’s more stringent regulation, the object was sequestered. Ali protested vociferously. He insisted it had belonged, like all of his loot, to his father who had bought it legally in the 1990s. He fought all attempts at restitution, and the case dragged through the courts for six years. A joint investigation by Swiss and Turkish authorities found that the sarcophagus had likely been looted from the ancient site of Perge in Antalya during an illegal excavation in the 1970s. This was confirmed by soil and marble analyses. How it wound its way from Turkey to Switzerland remains unclear and the Aboutaam’s father Sleiman died in 1998 so he can’t answer any questions. He also can’t be prosecuted. On September 21st, 2015, a Swiss prosecutor issued an order that the sarcophagus be restituted to Turkey. The Aboutaam’s appealed twice before withdrawing the last appeal in March 2016. That left the restitution order as the final legal say in the matter, and all that was left was for the slow grind of the legal grist mill to finish its work before the piece was returned. Culture and Tourism Ministry officials in Geneva received the sarcophagus on September 13th. It was in Turkey on September 14th. After almost seven years of legal wrangling, detective work and waiting, the Hercules sarcophagus was welcomed to its new home, the Antalya Museum, on Sunday in an unveiling ceremony presided over by Culture and Tourism Minister Numan Kurtulmuş. It is now on display next to the Weary Herakles, a Roman copy in marble of a 4th century B.C. original bronze by the Greek sculptor Lysippos of Sikyon, which was also looted from Perge and whose torso was pried out of the Boston Museum of Fine Arts after a lengthy battle so it could be reunited with the legs already on display the museum. 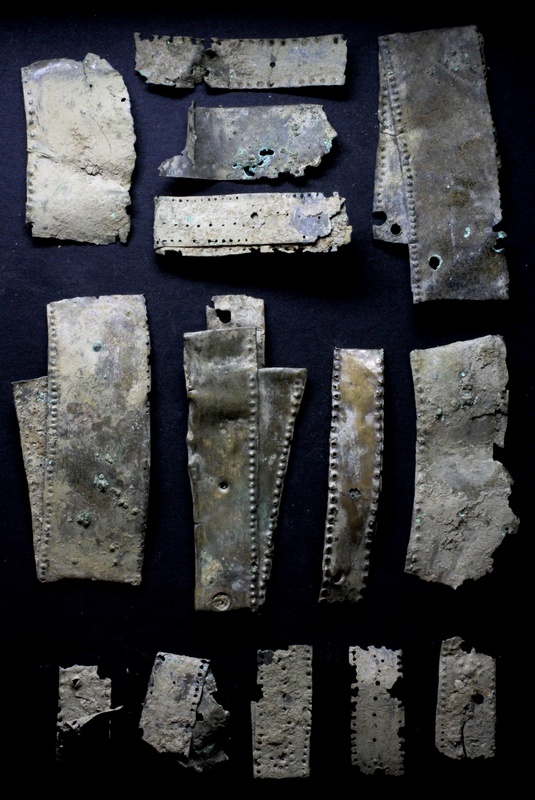 Metal detectorists in Cumbria have discovered a small Bronze Age hoard that is the first of its kind found in the county. The hoard was cached in a hole in the bedrock covered by stones. 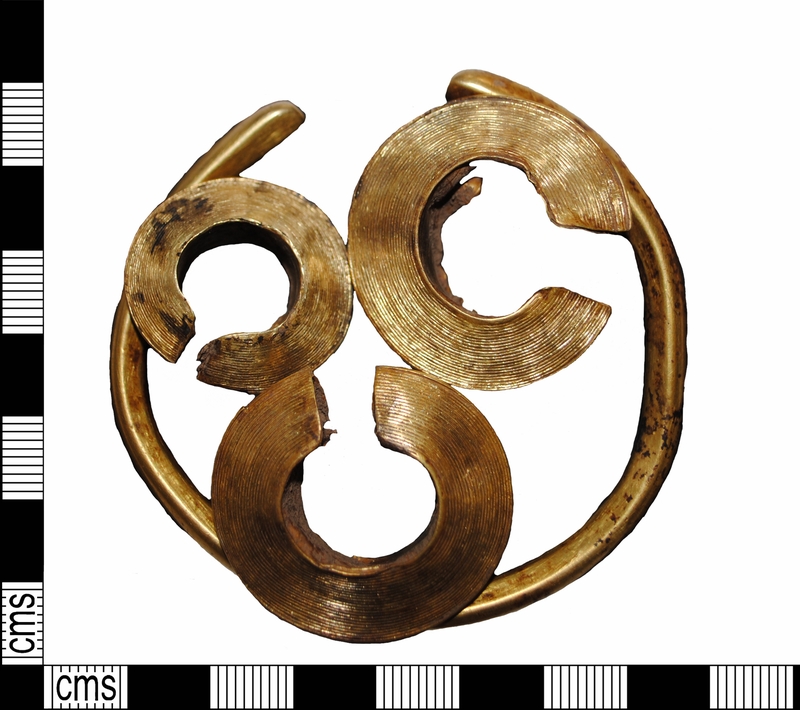 The group, small in size but large in historical significance, consists of one gold bracelet, three gold penannular lock-rings and one copper alloy cauldron fragment, all dating to the late Bronze Age. Three of the four jewelry pieces (the bracelet and two lock rings) have stains that may be corrosion or the residue of an organic material buried with them. The stains could also have been caused by something in the soil itself at the time of deposition, although if that were the case it seems like the other objects would have the same kind of staining. The lock rings are made from sheets of gold curved into circular shapes. They are bound to an outer circle with gold wire and have been delicately incised with concentric rings vaguely reminiscent of the tracks on old wax or vinyl records. Two of the lock rings are almost identical in size — only 1 cm difference in width and .1 gram in weight — and while the third is smaller than the other two, the craftsmanship is so similar experts believe they were created if not by the same hand, then by the same workshop. The lock rings, meanwhile, are very similar to an example from Portfield Camp, near Whalley, Lancashire. 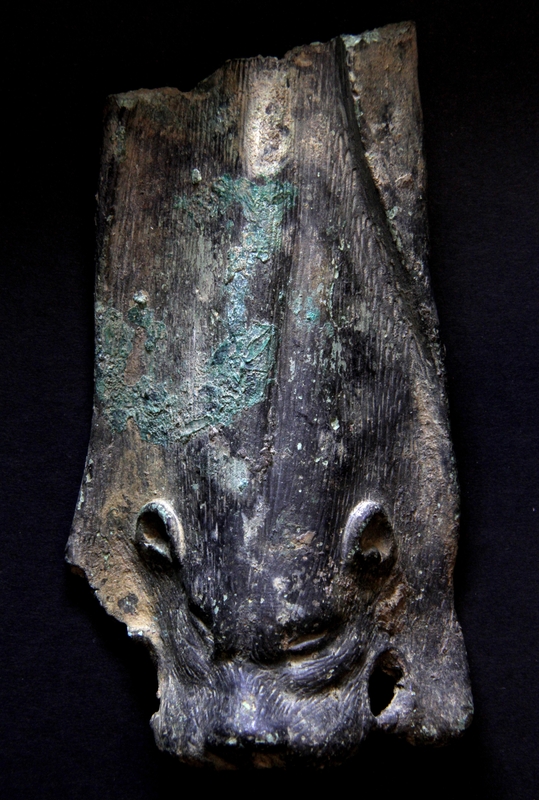 The purpose of this latter kind of artefact is much debated, through – as they are normally found in pairs, it has been suggested that they may have been a form of high-status personal ornament peculiar to the late Bronze Age (c.1000-800 BC), possibly earrings or some kind of hair decoration. 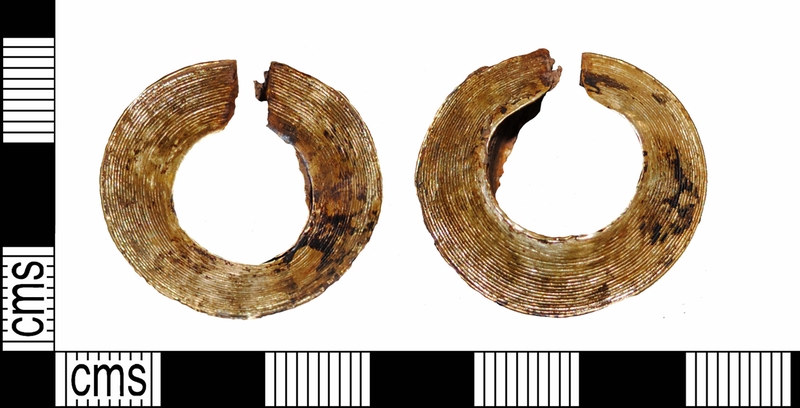 These newly discovered examples, decorated with concentric rings and bound with gold wire, are unusual for being a group of three. The gold penannular bracelet, with its undecorated design, flat, circular terminals and uneven curvature has features in common with an example now in the British Museum which was unearthed at Beachy Head, East Sussex, in the 19th century and is now in the British Museum. The bracelet and three lock rings are all a strong yellow color, an indication that the gold has copper added to the alloy. The find spot — isolated, out-of-reach, high places located near notable features like hillforts and stone circles — is very much in keeping with past Bronze Age lock ring finds. The cauldron fragment is unusual for a lock ring cache. It may have been a previous deposition, but experts don’t think so because it was so found so close to the other pieces that it seems they were all buried together. The findspot lies in an isolated high place on a prominent ridge that seems to have been an area visited throughout later prehistory. It is situated just below a possible Iron Age hillfort and close to a number of other prehistoric settlement sites, as well as a concentric stone circle. The presence of roughed-out stone axes found nearby hints at the site lying on one of the major transmission routes south for the Langdale axe factories during the Neolithic period, while socketed bronze axes that were also found nearby, probably from a smith’s hoard, point to the area’s importance during the Bronze Age. Sahl Church in the Northwest Jutland village of Sahl near Struer is a fine example of Romanesque architecture. Built around 1150 out of granite ashlars, it has several notable features: a rune stone built into the chapel’s west wall, 16th century frescos, a burgundy silk velvet chasuble embroidered with silver thread made from the wedding dress of Queen Anna Sophia that is still used today on special occasions. 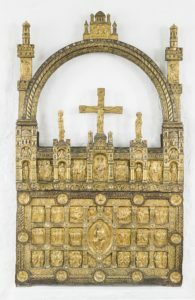 Its most spectacular feature is the Golden Altar, a gilded copper altarpiece made by a Danish master artisan from Ribe in around 1200. Embedded with crystals around the borders, the reliefs on the altarpiece panels depict figures and scenes from the Bible, particularly the childhood and suffering of Jesus, and Christian symbolism. 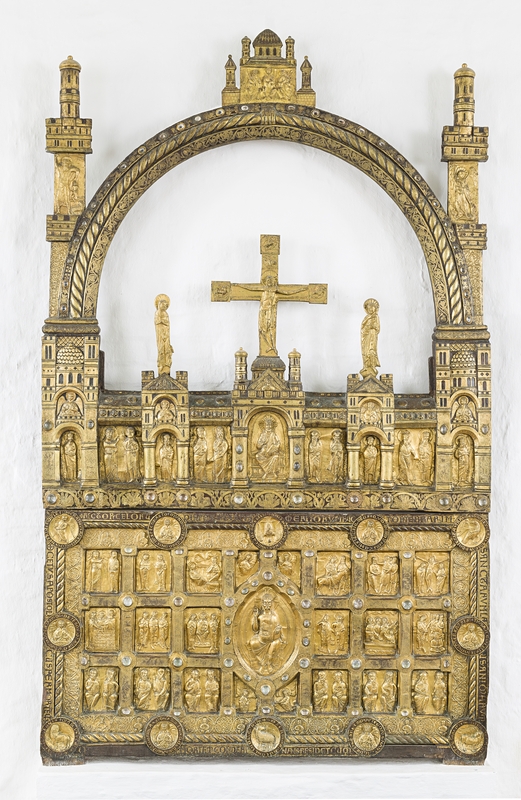 Popular devotional objects in the Middle Ages, only seven golden altars remain today in Denmark and only two of them in their original locations. (The rest are kept at the National Museum.) The bursts of iconoclastic zeal and the preference for plain church decor of the Reformation took a heavy toll on these objects. Many of them were destroyed and the ones that remain are not in the best of the condition. The altarpiece of Sahl Church is by far the best preserved of the seven, largely intact with no major missing parts. Most of the crystals were lost by the 1930s, but they were restored by National Museum experts in 1935. In 1850, Jens Jacob Asmussen Worsaae, an archaeologist who was Denmark’s Inspector for the Conservation of Antiquarian Monument, surveyed the church as part of an inspection tour of the area. 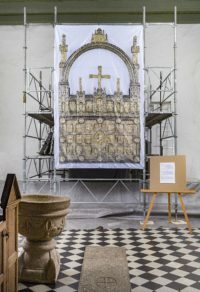 He warned in a letter that Sahl’s vicar was “adamant that the strange old altarpiece was to be removed” and when he wasn’t able to get rid of the priceless medieval gold and crystal altarpiece, he hired a local artist to paint over the wings. They weren’t original to the piece, thankfully, and they’re gone now but it lends some insight into why there are so few of these inestimable treasures left. Changes in fashion and taste can wreak havoc on historic artifacts, even ones whose value in sheer materials is blatantly obvious. This same vicar, by the way, also had the church’s medieval wooden coffer axed to pieces FOR FIREWOOD. Yet another page in the endless People Are Terrible ledger. The altar has not been absolutely dated. What we know of their ages has been deduced from analysis of the design style and craftsmanship. When it was last restored more than 80 years ago, it was only spruced up. 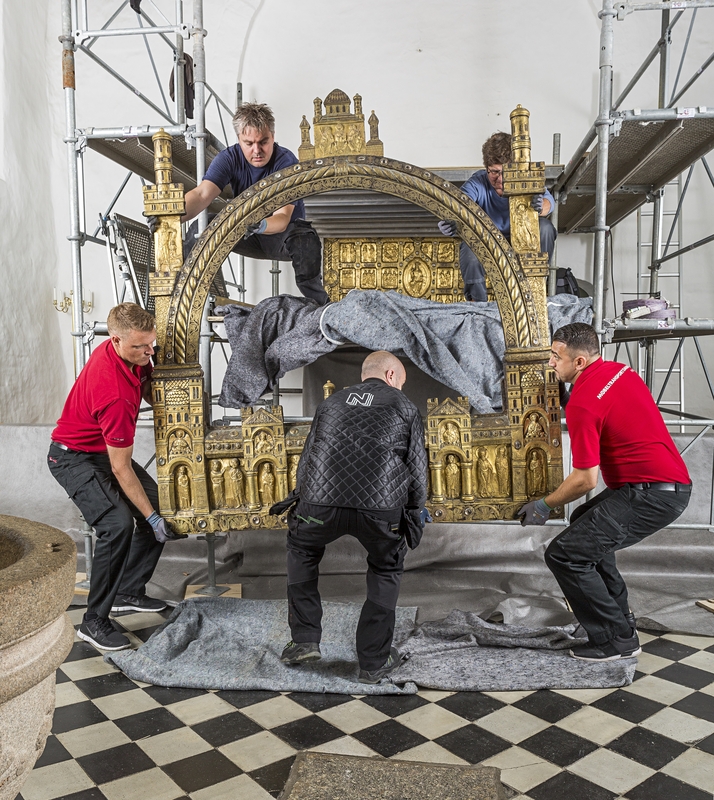 A new study of the Sahl Golden Altar by conservators at the National Museum of Denmark will give experts the opportunity to use modern methods of analysis to test the wood itself. Dendrochronology, if successful, can provide very precise dates. It will also be X-rayed and the gilding analyzed. They hope the study will reveal more information about the altar’s construction and materials. 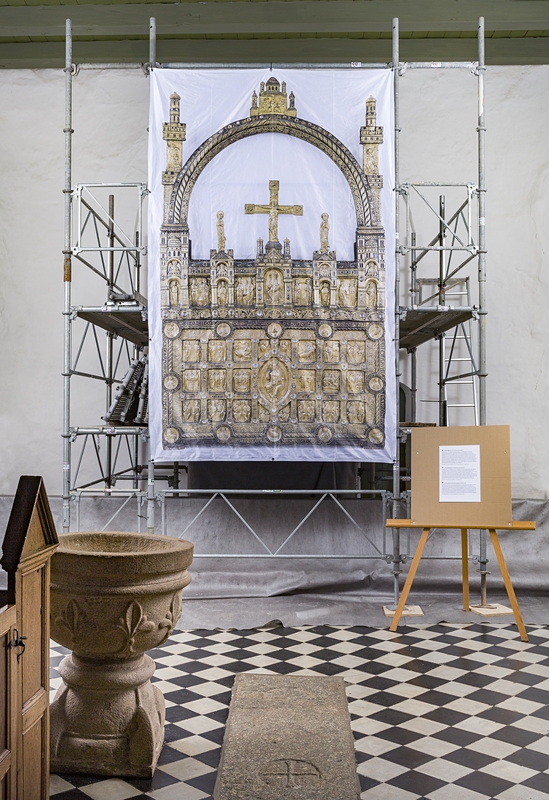 While the altar is at the museum, visitors to Sahl Church will see a large-scale photograph of it draped over its usual location. Within the last few years, the National Museum has conducted further studies on several of the golden altars. The results from this will be gathered in a publication about the unique cultural heritage of golden altars from the Middle Ages, which exists in Denmark. It is the Carlsberg Foundation, which has granted the money for analyzes of the alhl from Sahl, and the experts hope that the results will be available at the end of the year. In addition to a new study of the altar, the church itself will also be thoroughly reviewed. This appears in a publication published in the beginning of 2018, where the churches in Estvad, Rønbjerg and Vinderup will also be described. 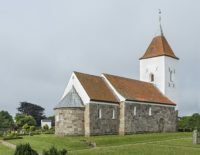 The publication of the four Western Jutland churches is published as a volume in the National Museum’s great work of Danish Churches, which aims to publish descriptions of all the churches of the country. The project started in 1933, and today about two thirds of the Danish churches are described.